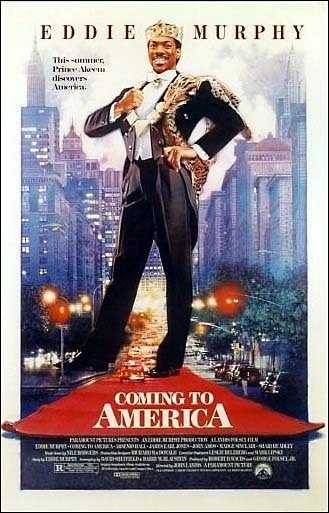 Coming to America. Paramount Pictures 1988. On the one hand, Eddie Murphy is a fish out of water in the part of his career before he decided playing multiple roles was a good substitute for being funny. On the other, I’m a little worried that this might not have much more to say than Trading Places did, only more one-sided and with uncomfortable stereotypes about native Africans the whole way through. Also, the last time I saw Eddie Murphy, he wasn’t being very funny. But that was more of a personal project for him, and he was unfunny in a meaningful way. Prince Akeem of the African nation Zamunda has turned 21, and it is time for him to meet the wife his family has chosen for him. However, Akeem is tired of having everyone wait on him, and instead of marrying the utterly subservient woman, he goes to New York to pose as a poor man and find a woman who will love him as an equal instead of obey him as a prince. There he finds work at knockoff fast food restaurant McDowell’s, just enough unlike that other place to keep the lawsuits from getting too close, and falls in love with the owner’s daughter Lisa. He must wait for the right time to tell her what he really is, but she’s dating a rich hair product heir, and Akeem’s servant resents the living conditions that Akeem has wished on them both. I spoke a little too soon when I said this was before Eddie Murphy decided that multiple roles could substitute for humor. He and his costar Arsenio Hall each have four minor, but mostly funny characters in addition to their main roles. They were so good at it, though, that I only spotted one of them. Eddie Murphy manages to disappear into three different roles in the same scene, and I only found it a little odd that one of them was always shot alone. I only realized that the old white Jewish man in the barber shop was Eddie Murphy when the film pointed out in the cameo-clip credits all the other roles, and then showed a long clip of the man telling a joke, and I realized it looked like white makeup on black skin. I really enjoyed Murphy’s Prince Akeem, too. He’s more understated than Murphy usually plays, but still especially high-energy for a comic straight man. Akeem’s smiley, good-natured, slightly innocent demeanor is something I’ve seen on real and fictional African immigrants living in America, and it looks good on Murphy. Unlike his Harlem Nights screaming, Arsenio Hall really demonstrates to me that he can act in this movie. Not much range is asked of him, but he’s deeper than the one-note gangster, and definitely putting on a new persona here. Also, this movie made me realize that I can’t think of any major on-camera roles James Earl Jones has had. I only know him as Darth Vader (voice), Mufasa (voice), “This is CNN”, and “James Earl Jones, well-known actor, plays _____”. As if anyone would doubt it, he’s well-suited to playing a king. I was concerned about the portrayal of African culture in this movie, but I guess I shouldn’t have been, with Eddie Murphy having a lot of creative control and several big-name black actors attached to the project. I felt that the Zamundan royal palace had a decent blend of African heritage and modern (Western) influence. The royals wear sharply-tailored colorful light-weight suits and dresses that have been accented with African jewelry, fabric designs, and pelts, making for a very modern, very regal, but distinctly African look. There are few sights more imposing than James Earl Jones wearing a smart suit and lion pelt wrap looking down at you and demanding to know where his son is. Don’t watch this movie: if you can’t enjoy Eddie Murphy if he’s not playing all the leads or the voice of a loveable animal.